Here's my Kourageous Flax finished. I had it completely finished today. Just in time for the end of the month due date. This block is my July 2011 UFO with Judy's Patchwork Times. Here's a photo of Kourageous so far. I've got seven blocks complete...bring on August's challenge! Here we are concluding yet another month of 2011. I'm working hard today this last day of July to finish up my July UFO. Goodness where has this month gone? Hopefully I'll get it done. I've got the collection of fabrics to choose from easy at hand, but still need to choose just which one of the animal themes that will be used for the Flax flower for my Kourageous project. More on this tomorrow...wish me luck! This week I've got several completions to share with you. Of course you know what this means...something to report as USED! YIPPEE! First up is Kottonwood Kurl from the Bonnie Hunter design Roll, Roll Cotton Boll. I finally got all the way around this big girl sewing down the binding. She's a beauty don't you agree? Next is Koncealed from the Debbie Caffrey design Secret Window that has been brought to us by Quiltmaker Magazine as a Mystery in three parts starting with the May/June 2011 issue. 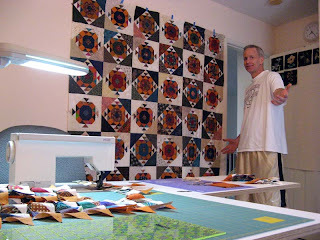 I host this Quilt Along project on Quilter's Club of America under Groups/Quiltmaker Groups. Becoming a member of the Group is FREE and works with the three magazine issues. 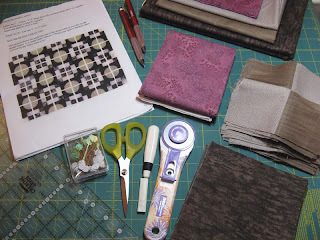 The final post went live on Friday with Secret Window Part 3 - Scrappy Cutting and Sewing...The REVEAL! The beautiful flowers are a gift to me from Quiltmaker for my efforts on the online quilt along project. Do you think it was planned that the flowers would match the colors of Koncealed? Korrecting Koncealed is a second Secret Window project that was my double check to make sure the words on the blog posts were accurate. It always amazes me how different fabric selections create such different projects. As I mentioned I can report fabric used this week. I'd already claimed Kottonwood Kurl, but Koncealed and Korrecting Koncealed combined added up. A good reporting week...notice I've stopped my purchasing spree? Did you use stash this week? 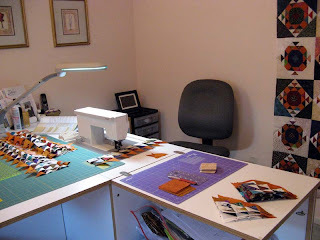 Look how other quilters are using their stash at Patchwork Times. Starting the last week of July 2011. I've still several projects set as goals for 2011. I really need to get busy! Of course taking on the unexpected workshop doesn't help, but it was very informative. The workshop was centered on circles. I don't know about you, not one of my favorite styles of sewing. I went with the hope of learning a thing or two to make circles something I didn't regret doing in a project. Can't say that my mind was changed that much. I did learn two things that makes the process a bit easier to achieve. First have a stylus. It's a tool that helps to pull and hold fabric. In the case with the circles it helps pull the bottom fabric to meet the top fabric and avoid puckers. I used the instructor's wood stylus and just loved it. Quilt in a Day did have a metal stylus, but I ended up with a Clover awl instead. The awl is very similar except that the tip is sharper then the wood stylus. It does have a great handle just like the one on their seam ripper. I'm on the hunt for a wooden stylus to include in my "tool box". The second thing is to put the flat piece on the top of the piece that has to be eased in the most. I'd always done this the opposite way so I could see the potential puckers, but as it turns out you have a tendency to want to manipulate the fabric too much. You still need to pin (use five pins) starting from the center then both ends and then between these pins. As long as you keep with the 1/4" seam those pesky puckers won't intrude into the stitching. The stylus and the needle down also provide some extra holders. I even got to the point of assembly line sewing. Yep felt much more comfortable with the process at the end of the day. I've got the borders to put on yet. This is the class sample that I plan to use as well. I've got enough of all the fabrics so I'm thinking I will use the three browns. My project is very Zen like so I'm thinking it will be gifted to Tammy since she's got her bedroom decorated Zen. Don't spill the beans. I did damage to my report this week. The temptation was just to strong on Friday at Quilt in a Day. I was there for my workshop "What Goes Around" with JoAnn Lamb﻿ and the fabrics on the right just jumped off the shelves! 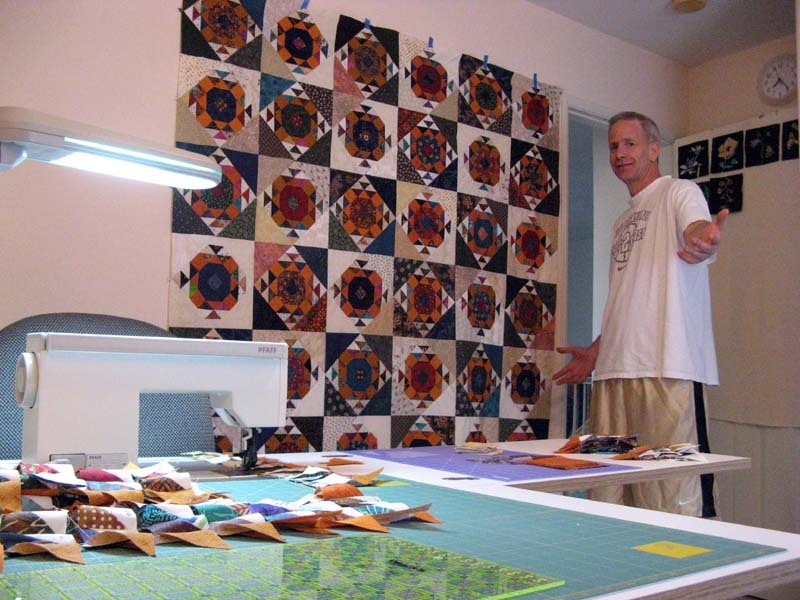 I'm going to be making a few quilts that require larger pieces than what can be found in my stash so...and did I mention that I was getting a pretty nice discount in the process? The fabrics on the left (like my neutrals Kathie?) are from Paradise Sewing. I was having my Pfaff serviced; it was ready to be picked up so off I went from my workshop to do just that. They were having a great sale buy one get one free with a five yard limit. My purchase was ten one yard cuts of neutrals. We can always use neutrals right? Needless to say my report is taking a nose dive this week...but I had fun! None of these fabrics will collect dust or hard to get out creases from spending time on my shelves. On my design wall, rather sewing cabinet... is my Pre Class Cutting and Sewing for the workshop I will be taking on Friday. I am using cotton fabrics in colors inspired by a quilt kit I have been noticing in the Keepsake Quilting catalog for the past several issues. Two of the four fabrics are from my stash and the other two were purchases at Amidon's (light taupe) and Memory Lane (plumb). 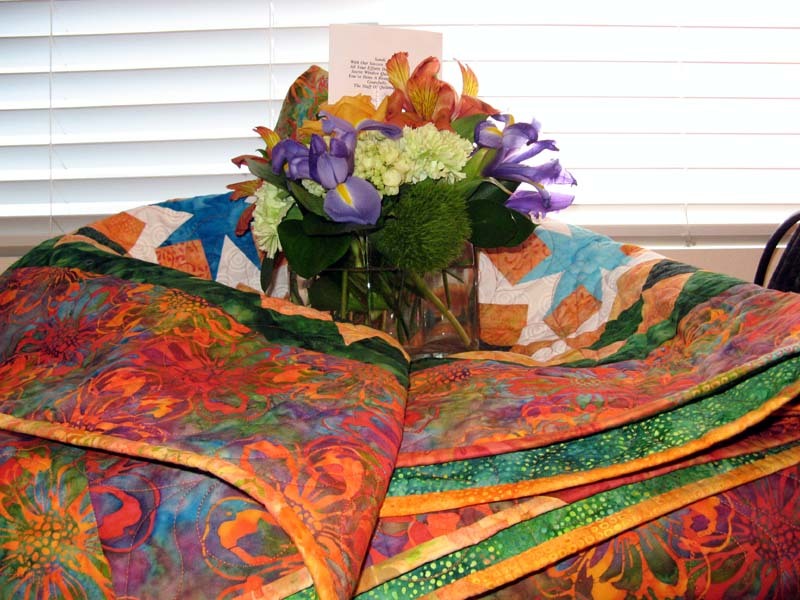 The workshop will be led by JoAnn Lamb at Quilt in a Day. We will be making the pattern What Goes Around. The challenging part of this class is learning how to sew the curves. I am anxious to see another technique for circles. There has to be one by someone that I will actually not mind doing. I am also packing up my Pfaff to have it serviced tomorrow. I have my Janome to use while its in the shop. Paradise Sewing takes care of it very nicely and have been doing it for sometime now. It should be gone for about a week. So what's going on in your sewing room today? My goal of last week has been achieved! The pieced border fit just perfectly. I love the results. 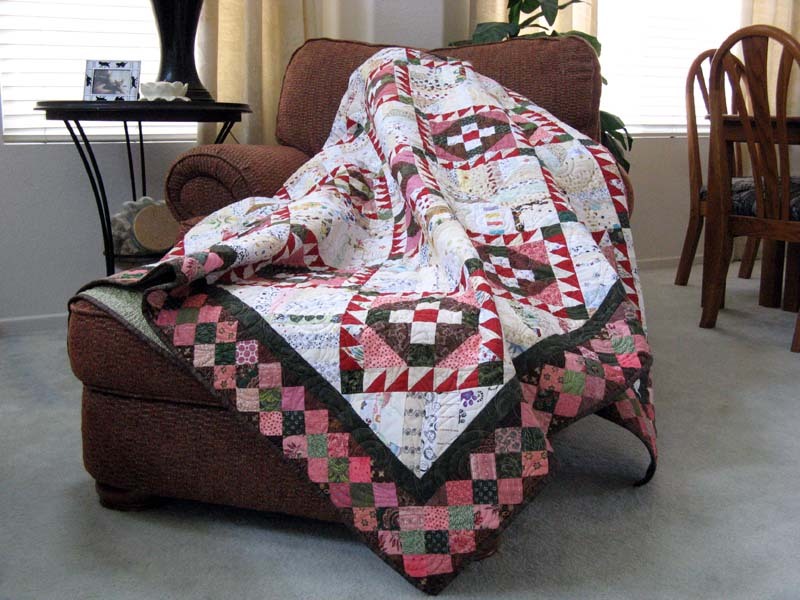 Kondor's Klutch (Bonnie Hunter's Hawk's Nest from her book Scraps and Shirttails II) will be on it's way to Kerry's Quilting as soon as arrangements can be made. I'm so happy with the results. My stash nearly provided all the fabrics for this project. I'll spend some time today working on What Goes Around the workshop I'll be taking this Friday at Quilt in a Day with JoAnna Lamb. My purchase this week was from Amidon Quiltworks. Two yards of the light for this workshop and since I couldn't part with any of my cream batiks two FQs for Bunko this past Monday at Memory Lane Quilt Shop. So for this week using my stash...it's been a good one! I was tied for biggest looser with Kerry. You should have seen all the silver beads around our necks! Since there needs to be only one 1st place looser and one 2nd place looser we had a roll of the dice for biggest number and I won, but just by one! In four rounds of play we each had 14 losses. Thanks Memory Lane and the Bunko Gals of last night. I had a very good time. Here's my winnings! 4 Creams, 4 Reds and 5 Blues. Now what to do with these? Next month's Bunko Night is August 1st. 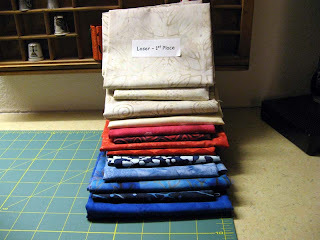 The anty will be six Batik FQs in the colors Purple and Teal plus $2. If I go, which I'm hoping to, I'll be sure to bring a goodie to share. It isn't part of the anty, but sure was nice during our intermission to snack on a cookie (the peanut butter chip were awesome). I did find time during that intermission to find fabric I had to have. I had a gift certificate in hand that worked out just perfect. When I left Memory Lane not only did I have my winnings but a piece needed to finish the supply list for a workshop I'll be taking at Quilt in a Day next Friday along with three yards of a deep chocolate brown that's sure to be in a scrappy project I'll take on by Bonnie Hunter or Judy Laquidara. These two are always coming up with something I want to make. Thanks everyone for wishing me a lucky BUNKO night! This is what's left to sew for the borders. I discovered that I didn't have enough HSTs :(! You can see the small stack of neutrals queued up and ready for more assembly line sewing. The strips on the left are nearly three of the four borders ready for final assembly. 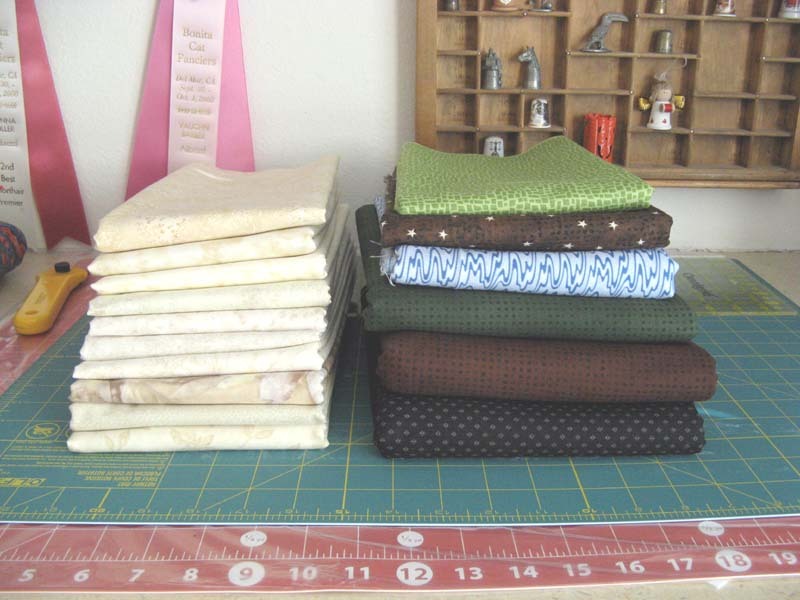 The top and bottom are 28 rows of three HSTs with a triangle of cheddar on either side. The sides are 33 rows of the same. Not counting the corner sections and left border pieces we're talking 366 HSTs in the four borders. I'm in the final chapters of this project. On to the next project...I need to get everything together for a workshop that I'll be taking at Quilt in a Day next Friday. There is some prep work involved. Cutting and sewing four patches. This workshop involves CURVES! I'm hoping to come home with some great batiks winning big at Bunko later tonight. 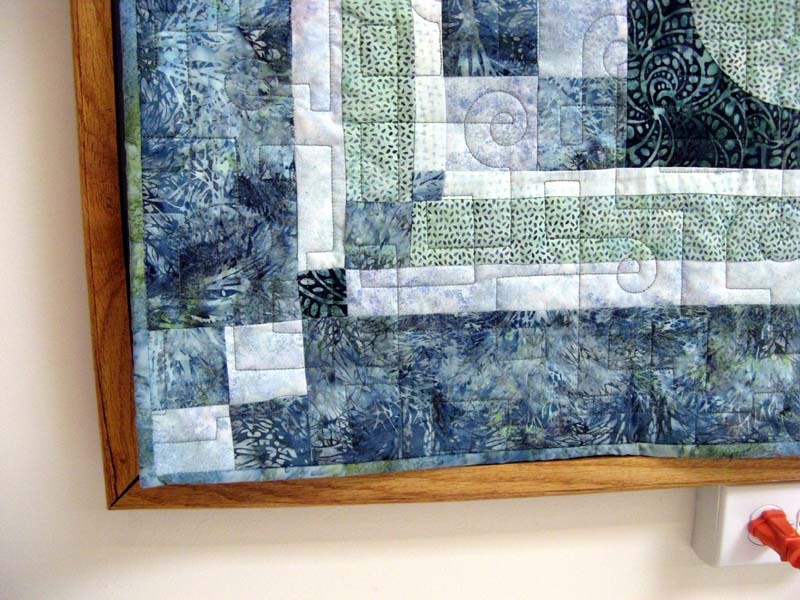 Check out other Design Walls from quilters around the globe at Patchwork Times! Have a great week. I've been working a little bit on the binding of Kottonwood Kurl. It's been on the warm side these last few days. Having this large quilt in my lap is just too hot. Most of the past week I've been working on Kondor's Klutch. After today's time in the sewing room I should have quite a bit of the borders done. Both Kottonwood Kurl and Kondor's Klutch are Bonnie Hunter designs that can be found in her book Scraps and Shirttails II. At 8am this morning I signed up for two workshops at Road to California that will be held in January 2012. Kerry and I will be taking Scrappy Layered Log Cabin with Karen Eckmeier and the Lakeside Mystery 1 by Tracey Brookshier. 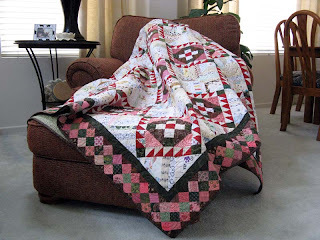 Tomorrow I'm going to join quilters at Memory Lane for Bunko. It's a fun time where the winnings are Batik Fat Quarters. This month we are to bring red, cream, and blue. So today my stash gets reduced by 1.5 yards. Perhaps next week I'll be able to record the yardage used from Kondor's Klutch. A very short work week for me. Too bad each week wasn't the same...imagine how much more sewing I could accomplish. Oh well, for now and the immediate future it's what's to be. But for now I'm going to relish the fact that this week was a holiday day on Monday, one day off on Tuesday, and a regularly scheduled Off Friday. I'm certainly enjoying it now because come next Monday it's back to a full week of 9 hour days. I've counted all the parts and pieces of my July UFO with Judy's Patchwork Times. This month the Flax Flower was selected, it's #2. As I mentioned in an earlier post this one was going to be a walk in the park. It has just 74 pieces and only 13 Sections. I'm planning on selecting fabrics for this block over the weekend. The pattern is copied to the correct size for finishing at 6". I'm all set to sew! Kourageous is coming along quite nicely. Kondor's Klutch is coming along nicely too. This is Bonnie Hunter's Hawk's Nest design from her third book. I've got the "nests" and the hour glass blocks all done and stitched together for the center of the quilt. Next is the cheddar inner border. I'll be using the lighter cheddar for this 1 1/4" border. I've already started the 438 HST pieces...that is the cutting and marking. I'll be working on the sewing over the weekend. I've only got 58 of what is needed done. Much more to go! Hope you've had a great week so far. Hope that you find time and desire to enjoy a fireworks display today. We have friends and their three children coming over for the traditional cook out. We'll be having hamburgers, hot dogs, corn on the cob and who knows what else. We can see the fireworks display at two different locations and hear it loud from one of these two. Of course our big screen and stereo will be showing/playing one of the big celebrations...just in case getting it live isn't enough! After the setting triangles comes the "Extreme" pieced border (the exact words from Bonnie's pattern) which is made up of 1 1/2" HST like what was used in the "nests", but a considerable amount more...438 of these. 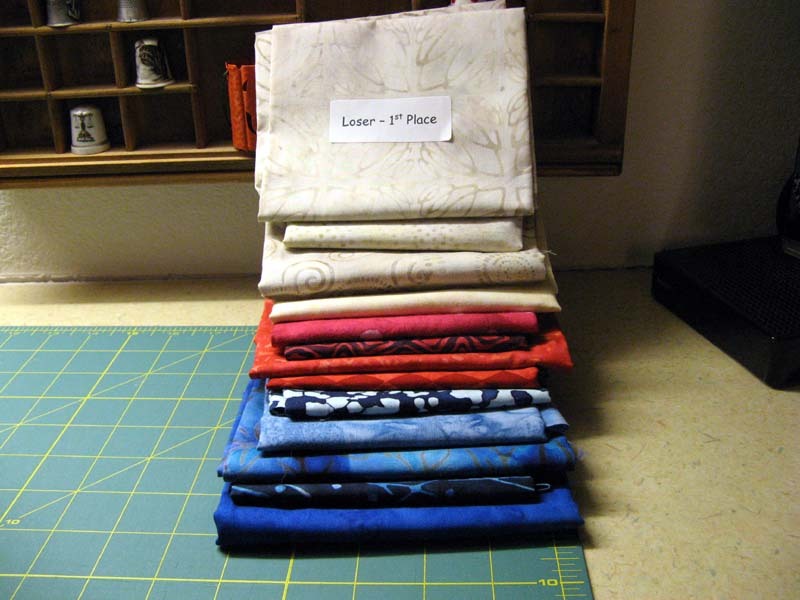 Bonnie says that you don't have to make them all at once, but hey...I'm excited...I'll be speed piecing later this afternoon like there is no tomorrow. This Bonnie Hunter pattern is available in her Scraps and Shirttails II book. Her third book and definitely my favorite so far. Check out other design walls today on the 4th of July at Patchwork Times. Here it is another week done and another week started. I've got the 4th off...hope that you do too! I also took off Tuesday so only 2 days of work this week...YIPPEE! Stash report has no change this week. I'm getting closer to being able to claim yardage usage for Kondor's Klutch (aka Bonnie Hunter's design Hawk's Nest), but not this week. Before I show you my stats this first week of July, here is Koasting. Koasting is a Judy pattern called Making Ends Meet. 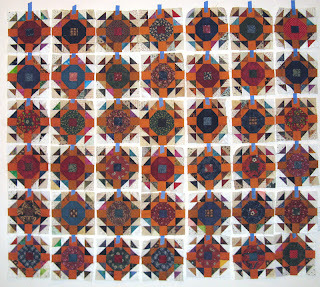 All done and being displayed on the "New Quilt Wall" in my foyer. Koasting was quilted with jungle animals that are similar to what's in the left border and corner stones. Koasting was ALL scraps...wish I'd have had enough of the left border to go around, but scraps are what they are if you know what I mean! Do take a couple of minutes and look out how everyone else is doing using their stash at Patchwork Times. Judy at Patchwork Times selected #2 for July's UFO Challenge. My #2 is the Flax flower block. This is the seventh block of my animal theme exotic flowers project that will be called Kourageous. This one should add to the embroidery stitching that is on the Bellflower block (March). The Flax block should be a walk in the park after the Larkspur block (June).